We’ve covered DGC’s favourite spots for Korean cuisine and favourite bubble tea flavours… but what about our favourite Korean dishes? The results of our poll are officially in: these are DGC Dance’s Top 5 Korean Dishes. A Korean barbecue staple (and literally translating as ‘fire meat’), bulgogi is thinly-sliced meat marinated in a sweet-savoury concoction of Asian pear and soy sauce. The meat is typically beef, but some restaurants also offer bulgogi pork and chicken, marinated in the same sauce. This spicy sticky rice cake dish is super filling and super satisfying. Made with cylindrical sticky rice cakes, fish cakes and a fiery sauce, it’s occasionally also served with melted cheese (which some of us are huge fans of!). Jjigae is the Korean answer to stew: various delicious things boiled in a broth until flavourful and tender. It comes in several different forms, from meat and seafood to tofu and veggie. It’s often served in a sizzling-hot stone bowl, which looks amazing as it bubbles away at the table, and many restaurants include a bowl of rice with it on the side. OK, so kimchi isn’t so much of a dish as a side-dish – but you can’t have a list of favourite Korean foods and not have kimchi. It certainly deserves all the votes it got: the spicy, salty fermented spicy cabbage is positively iconic in Korean culture, and has even become somewhat prominent in the health food scene. It also has a very pungent smell that even gets through tupperware. Did you know that many Korean households have a completely separate fridge for kimchi? 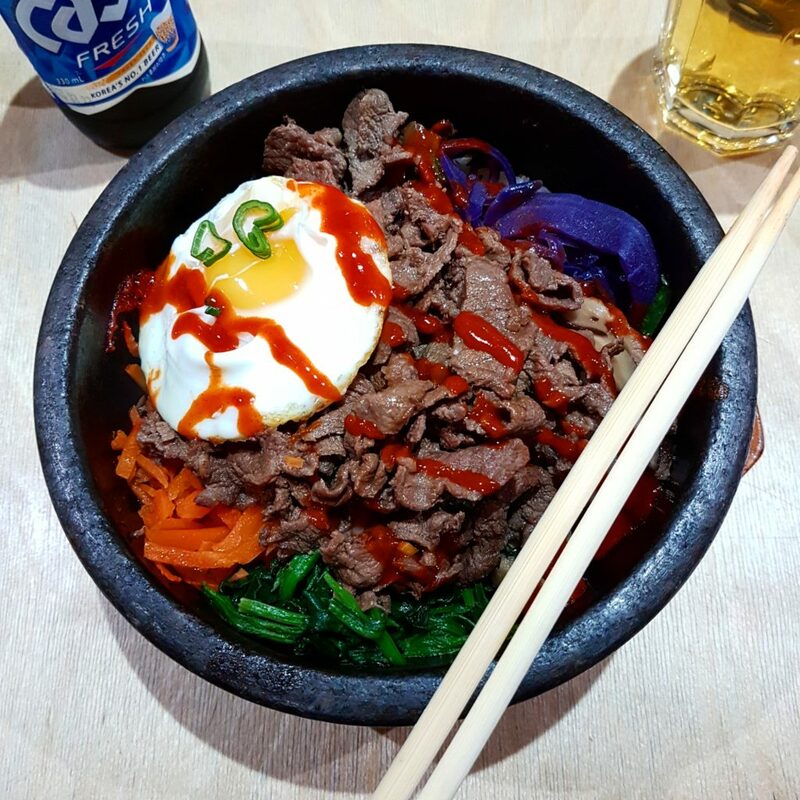 It’s official: bibimbap is DGC’s favourite Korean dish! The basic dish is made with a bowl of rice topped with marinated vegetables and served with spicy gochujang sauce, but can also include bulgogi, egg, tofu and more. You can often order it in a ‘dolsot’ hot stone bowl, which comes sizzling to your table and makes the rice deliciously crispy at the bottom, and sometimes there’s an option to add raw beef that cooks itself on contact with the hot stone. It’s often one of the best-value meals on the menu in a Korean restaurant too. Obviously there are a lot more amazing dishes that we always end up ordering too – these were just the five with the top votes. But the best thing about Korean food is it’s always perfect for sharing, so you get to try a bit of everything… and bond with your fellow dancers, of course!